Devil's Punchbowl is an LA County park that's located in the lower chaparral foothills of the San Gabriel Mountains. 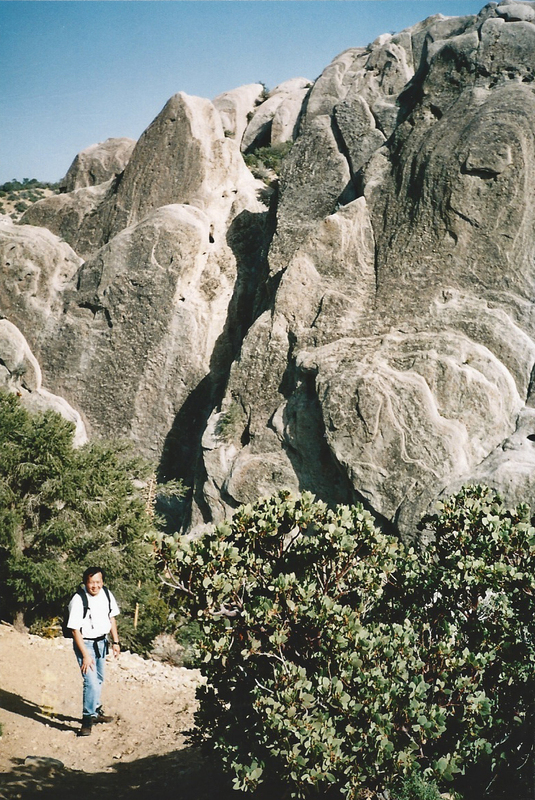 For many, the main attraction of the park is its stunning geological features. 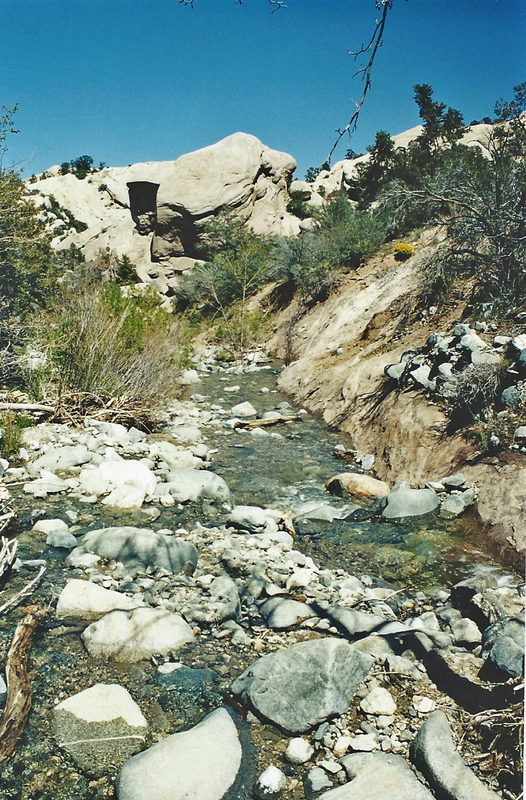 The punchbowl itself is essentially a deep canyon that's flanked by the towering 8,000' peaks of the northern San Gabriels. The steeply uptilted sedimentary rock formations are the result of ongoing pressures from the Punchbowl, Pinyon, and San Andreas Faults. In addition to the awesome scenery, one of the real draws for me are the phenomenal spring wildflower displays in wet years. As you head up from the desert town of Pearblossom in the Antelope Valley to County Rd. N-6 (Longview/Fort Tejon Rd. ), you can see desert mariposa lily (Calochortus kennedyi), Parry's gilia, desert calico, and rattlesnake weed. 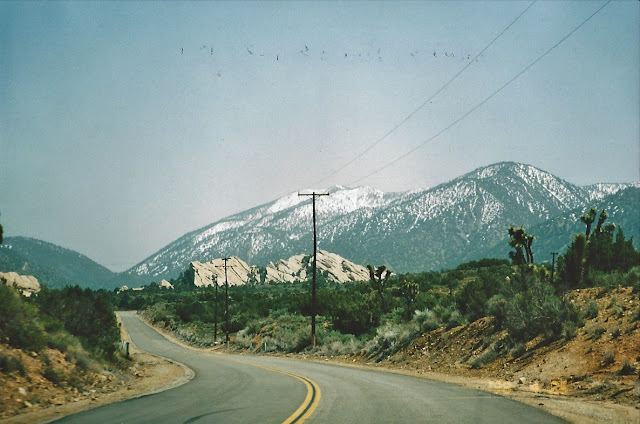 As you go up in elevation, the plant communities change, from creosote scrub, Joshua trees & junipers, to pinyon pines, big berry manzanitas, scrub oaks & chaparral. 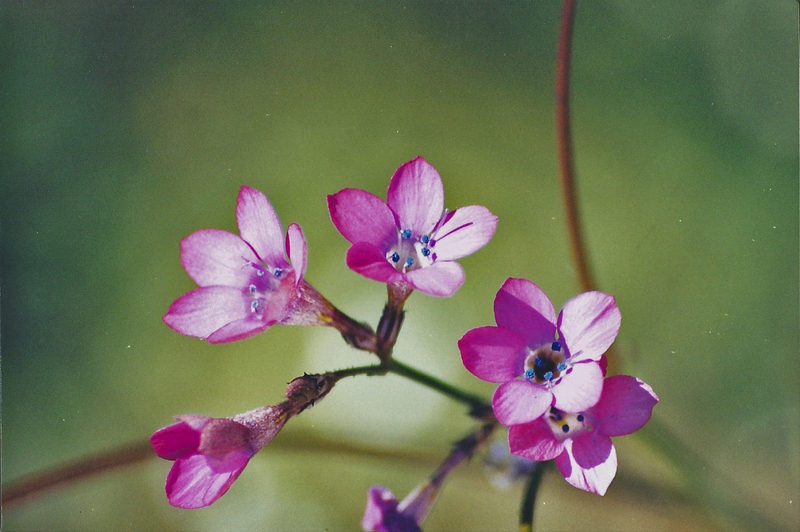 Wildflowers such as gilias, blue dicks, sun cups, white tidy tips, muillas, Fremont monkeyflowers, Fremont phacelia, blazing stars, lupines, Western wallflowers and scarlet buglars can be found on the trails from the visitor center. 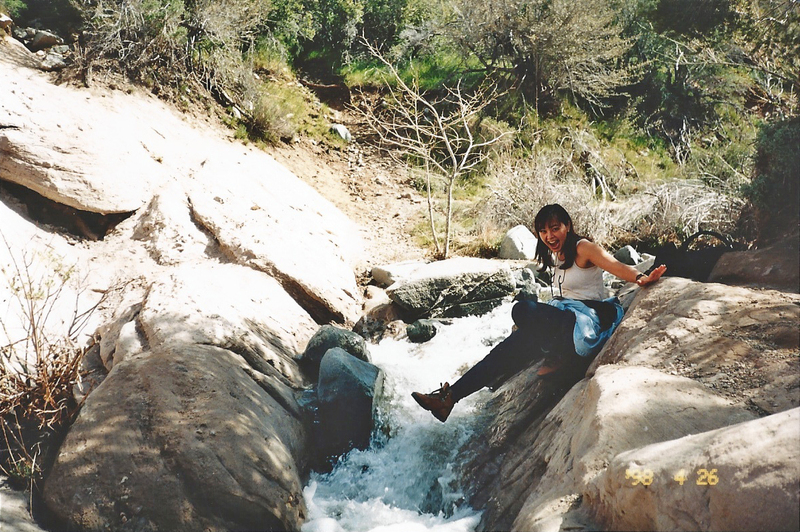 4/26/98 Punchbowl Creek at the bottom of the canyon. 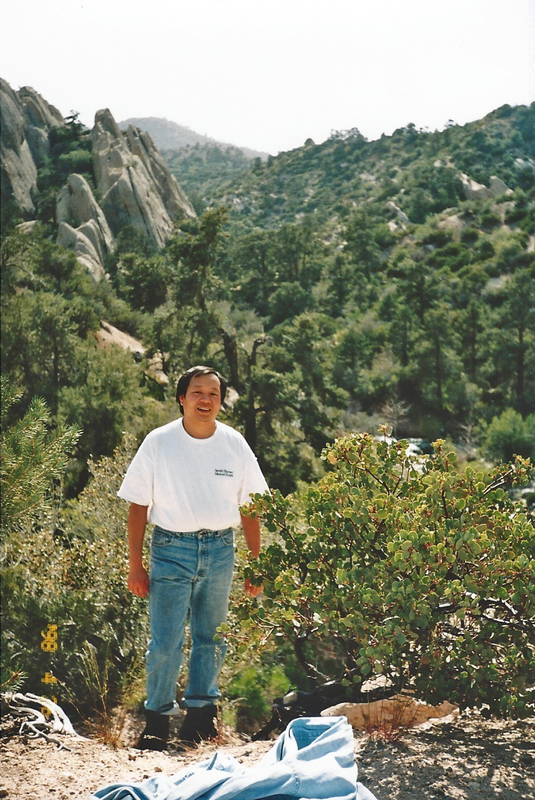 4/26/98 Gil next to a Big Berry Manzanita. Loop Trail. 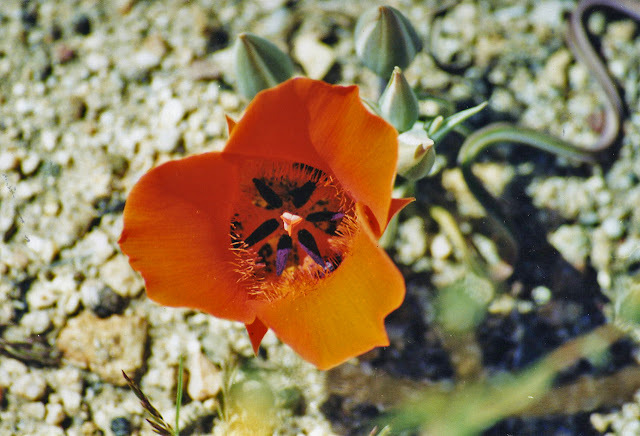 5/10/03 Desert Mariposa Lily (Calochortus kennedyi). N-6 (Fort Tejon Rd.). 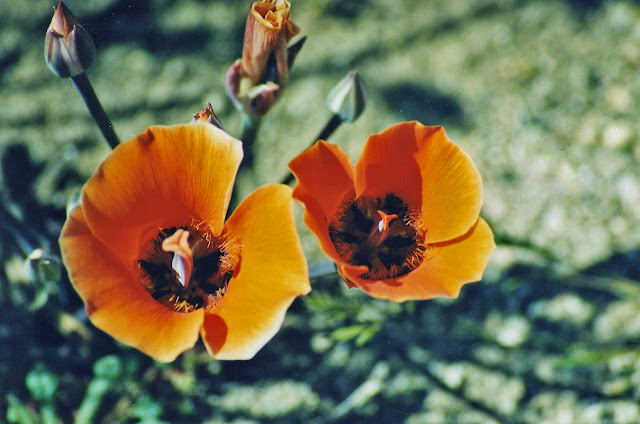 5/10/03 Desert Mariposa Lilies (Calochortus kennedyi). N-6 (Fort Tejon Rd.). 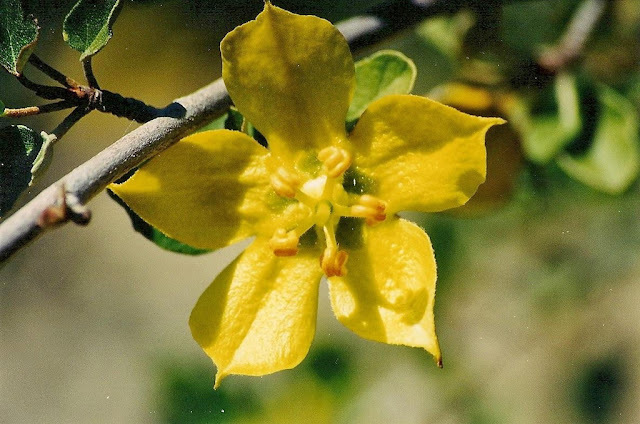 5/10/03 California Flannel Bush/Fremontia (Fremontodendron californicum). 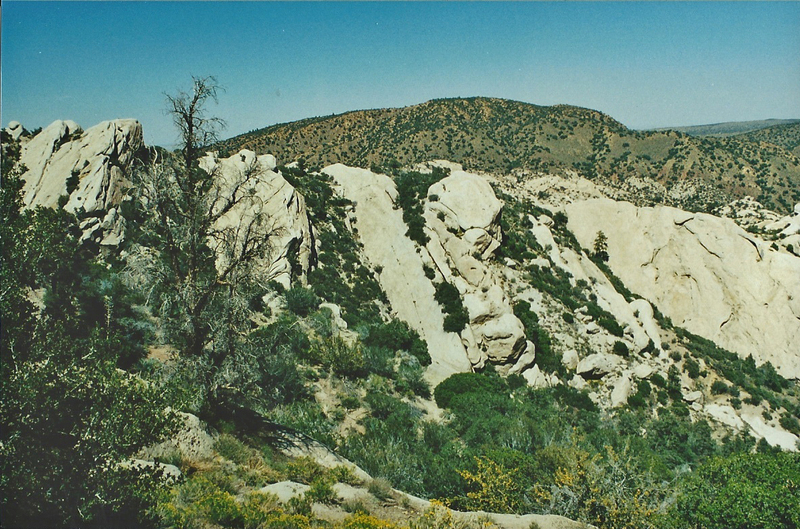 Devil's Punchbowl. 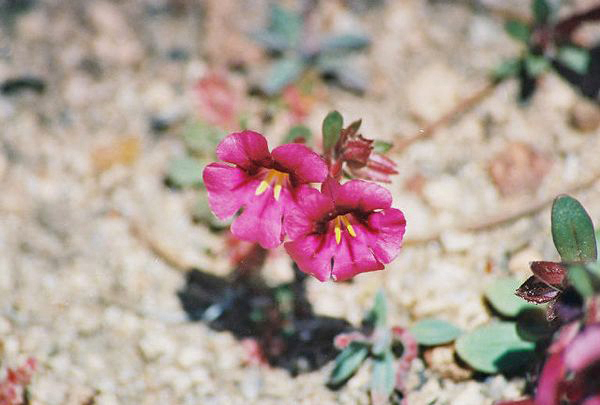 5/10/03 Fremont's Monkeyflower (Mimulus fremontii). Pinyon Pathway. 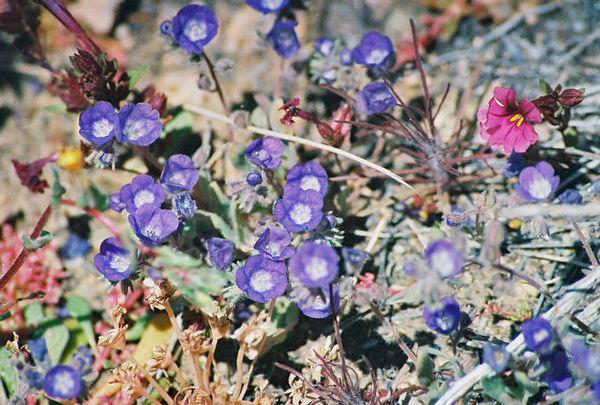 5/10/03 Washoe Phacelia (Phacelia curvipes). Pinyon Pathway. 5/10/03 Muilla (Muilla maritima). Devil's Punchbowl. 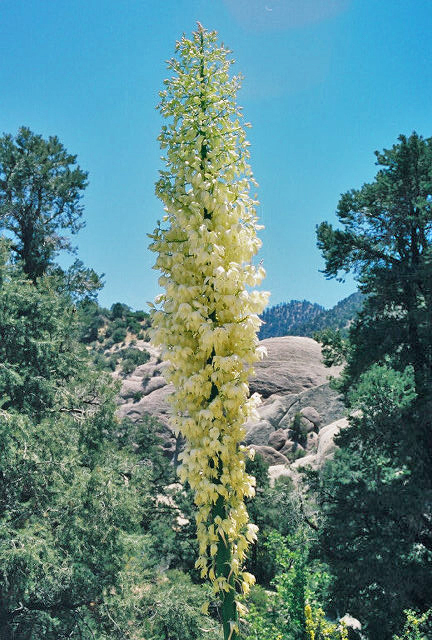 5/13/00 Our Lord's Candle (Yucca whipplei). 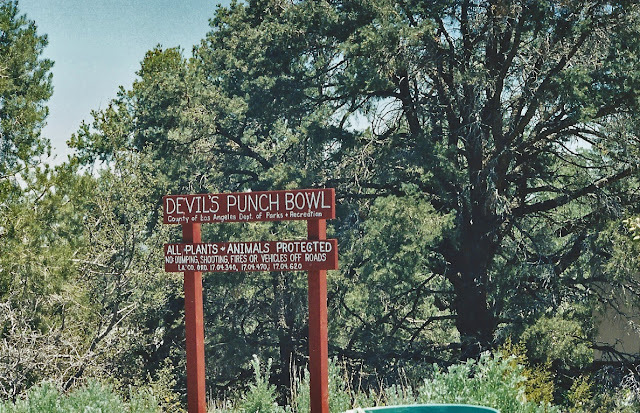 Devil's Punchbowl. 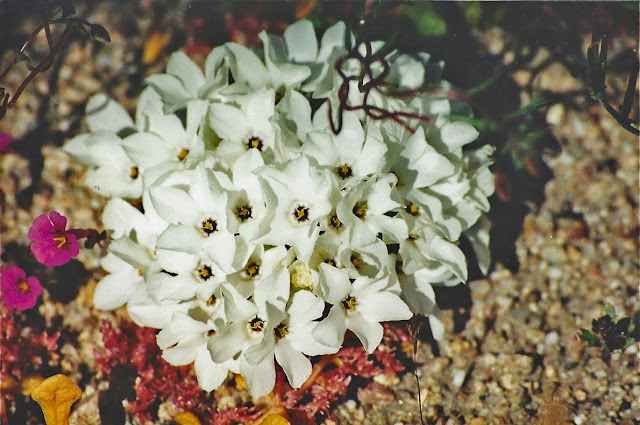 5/10/03 Linanthus spp. Pinyon Pathway. 5/10/03 Broad-flowered Gilia/Davy Gilia (Gilia latiflora ssp. davyi). 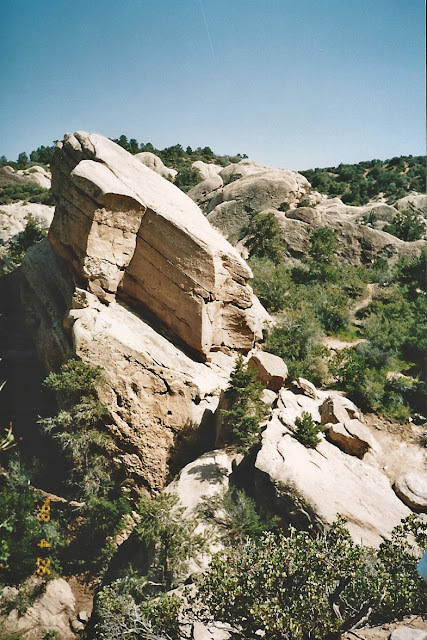 Devil's Punchbowl. 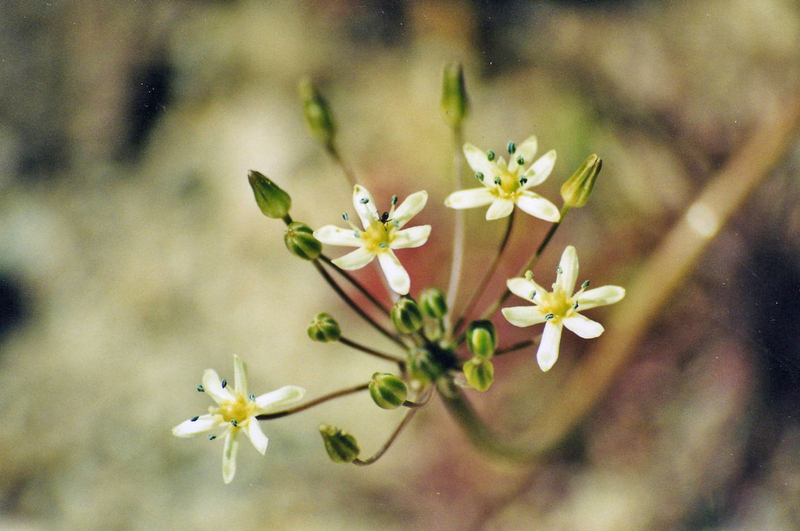 5/10/03 Parry's Linanthus (Linanthus parryae). 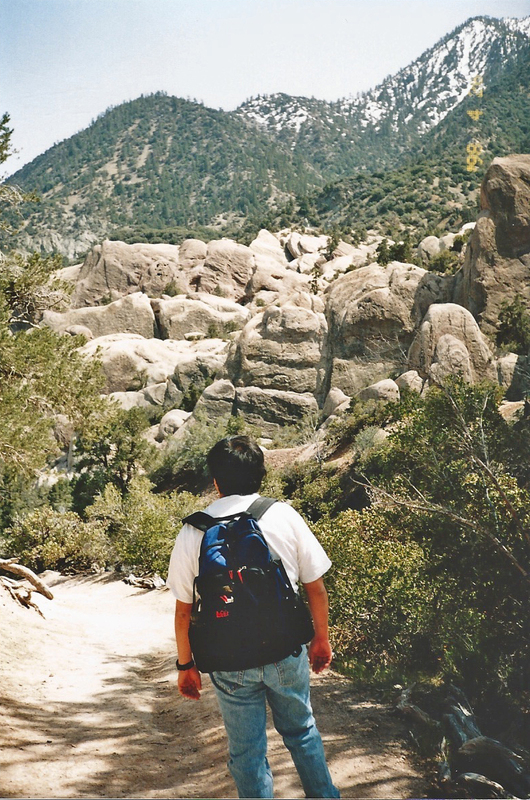 Loop Trail, Devil's Punchbowl. 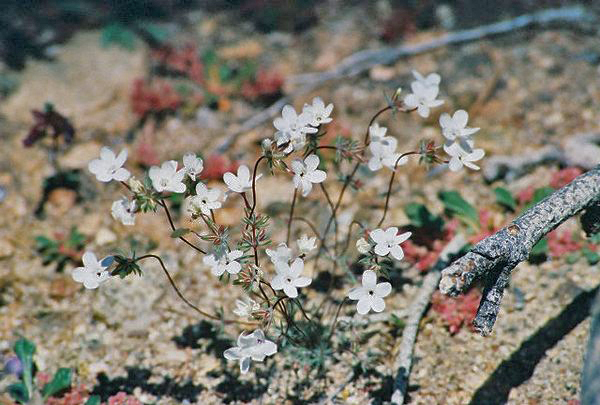 5/10/03 Parry's Linanthus (Linanthus parryae). 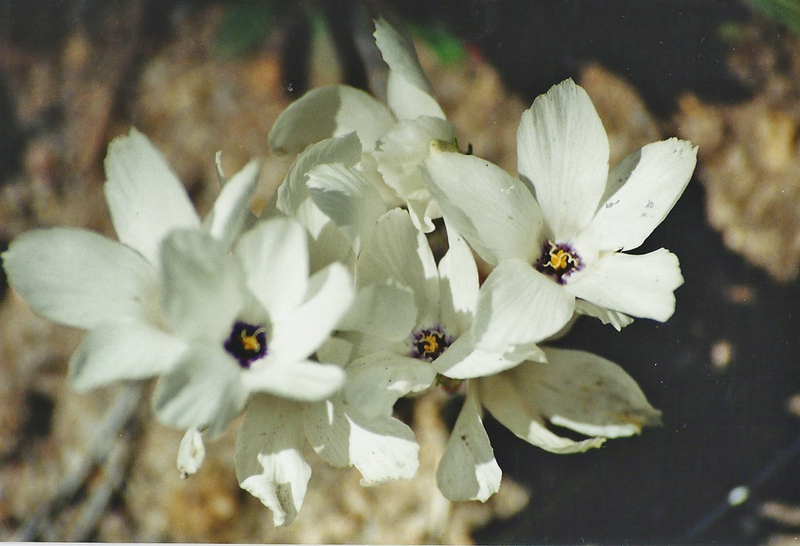 The flowers can be white or blue-purple. N-6 (Ft. Tejon Rd.). 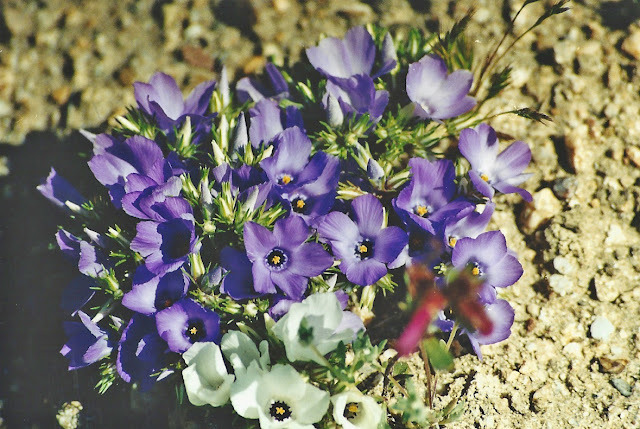 5/10/03 Parry's Linanthus (Linanthus parryae). N-6 (Ft. Tejon Rd.). 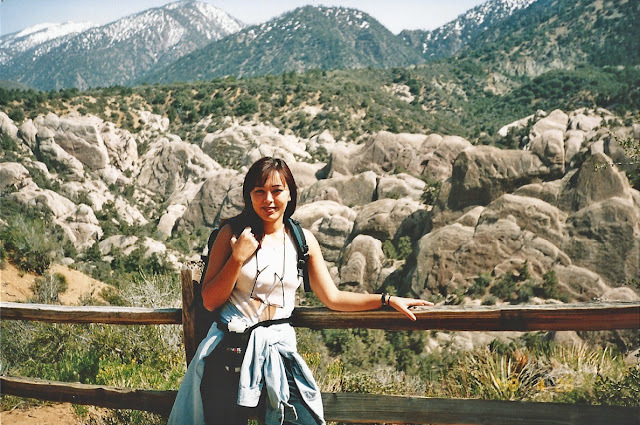 Location: A spectacular setting of rugged rock formations along the San Andreas fault on the north slope of the San Gabriel Mountains, sandwiched between the high desert and the Angeles National Forest. Elevation: Park climbs from 4,200 ft. to 6,500 ft. in elevation. Directions: From Hwy. 138W in Pearblossom, follow signs to the park and turn left on Longview Rd. (Chevron station). Continue following signs to the park via N-6. At first stop sign, turn left on Fort Tejon Rd./N-6. About 1/4 mile up, turn right onto Longview Rd./N-6. At Tumbleweed Rd./N-6, turn right - this becomes Punchbowl Rd. Continue a few miles up to a paved parking lot (it's about 7 miles from the N-6 turnoff to the park). Road Conditions: Hwy. 138 is paved, 2-lane (not too many curves). N-6 is also a paved 2-lane road. Trails: Pinyon Pathway trail is an easy self-guided 1/3 mile loop. The one-mile Loop Trail descends 300 ft. down to the bottom of the Punchbowl canyon and creek, with several access points to the creek from the main trail. 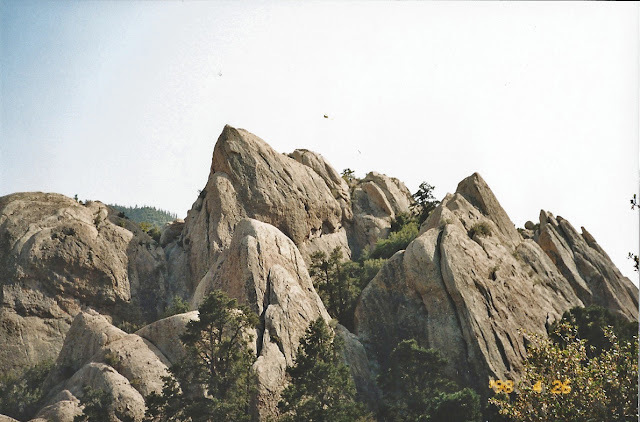 Burkhart trail has a 1,000' elevation gain (7 miles round trip, about a 3-4 hour hike) through yellow pine forest to a unique formation known as Devil's Chair. Great views and about the same difficulty as the first part of the Loop Trail. A ranger told us that he found marine fossils near Devil's Chair. Amenities: Paved parking lot, picnic tables & BBQ, restrooms and port-a-potties at the nature center. 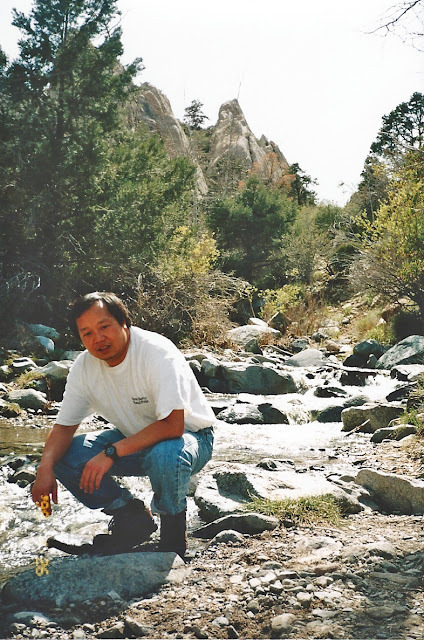 The last time we visited in 2003, there was a soda & ice dispenser at the nature center. Visitor Center: Interpretive displays, maps, books, natural history museum. Ranger programs, full moon hikes, meteor shower programs, geology programs, San Andreas Fault hike, and other seasonal programs are offered throughout the year. In 2003, there were live reptile exhibits and raptors (including a barn owl, great horned owl and red-tailed hawk). Fees: None, although donations are accepted. Hours: Nature center daily, 8am - 4pm. Closed Mondays & Christmas day. Park hours are sunrise to sunset. Pets: Pooches allowed on trails (leashed). Equestrian trails. 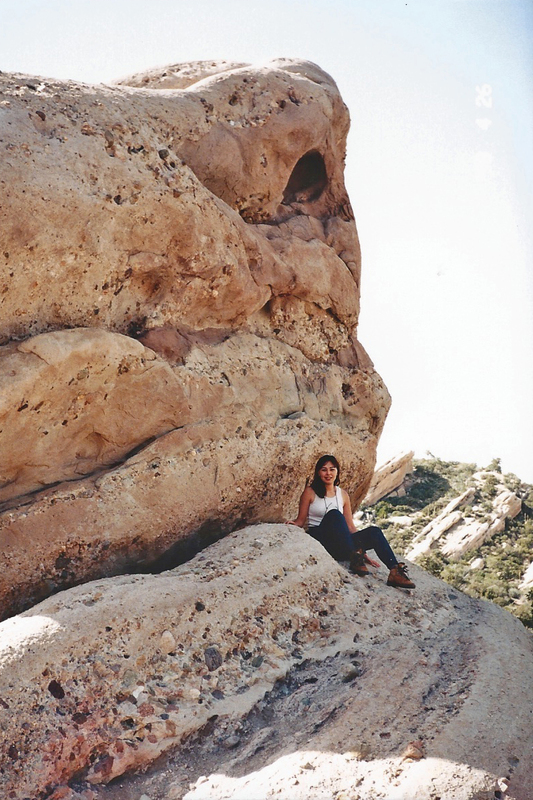 Contact Info: Devil's Punchbowl Nature Center, 28000 Devil's Punchbowl Rd., Pearblossom, CA 93553. Tel (661)944-2743. Flora & Fauna: The area is a blend of Pinyon pine woodland and desert chaparral plant communities, with bigberry manzanita, scrub oak, basin sagebrush, mountain mahogany, yerba santa, yucca. Riparian plants creekside include sycamore, alders, etc. What we saw: Along the Loop Trail: pinyon pines, manzanitas, creosote, gilia ssp., blue dicks, fremont phacelia, sticky phacelia, chia, western wallflower, miner's lettuce, hairy lotus, flannelbush, muilla, Fremont's monkeyflower, desert tidy tips. Roadside off N-6: Parry's linanthus, rattlesnake weed, desert mariposa lily, desert calico.